Our Hemp Hookahzz E-Cig Kit provides the ultimate in CBD oil versatility via a reliable, rechargeable electronic cigarette. 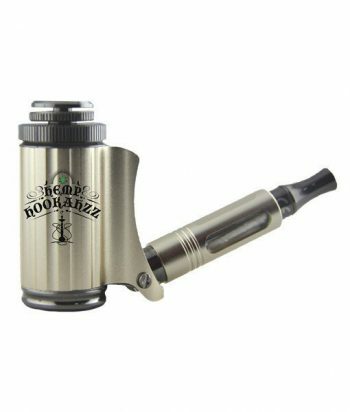 Enjoy your CBD oil on the road, at home, or at work with this popular, pocket-sized e-cig from Hemp Hookahzz. 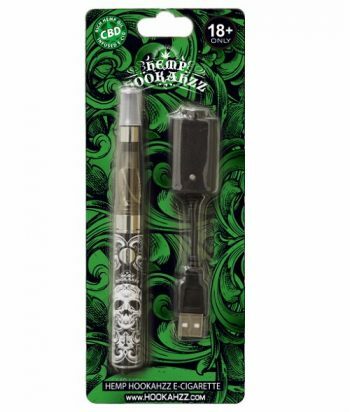 To start off, each Hemp Hookahzz E-Cig Kit comes preloaded with high quality CBD oil. The oil comes either mixed with nicotine or without, providing an additional touch of versatility. Along with choices in nicotine and non-nicotine canabidiol, those who use this e-cig will enjoy a cool range of flavor choices, from Double Applezz to Melon Madnezz, Fresh Mintzz and Pink Diva. All oil is harvested from 100% chemical-free cannabis, and all subsequent processes are equally natural and additive-free. This e-cig and its particular cartridges are known for an output that is rich and satisfying yet noticeably smooth and enjoyable. When your e-cig runs low on battery power, simply plug it in to charge anywhere there is a USB connection. Likewise, if your e-cig runs low on oil, simply fill it back up instantly with the Hemp Hookahzz refill oil of your choice. Check out our selection of compatible CBD oils for all of your refill needs. In the spirit of unabated access to some of the best CBD products in the world, we offer free shipping on this and all other CBD products available through our e-store. Buy with confidence, knowing that you are receiving a 100%, completely legal product that is always backed by real quality and expertise. Why wait? Try one for yourself now. haven't used it enough to judge. I think it is soothing. It was perfect for first time user. And got refill that was easy to use. I like the flavor and the smooth vape but you don't get much oil in the cartridges for the money.